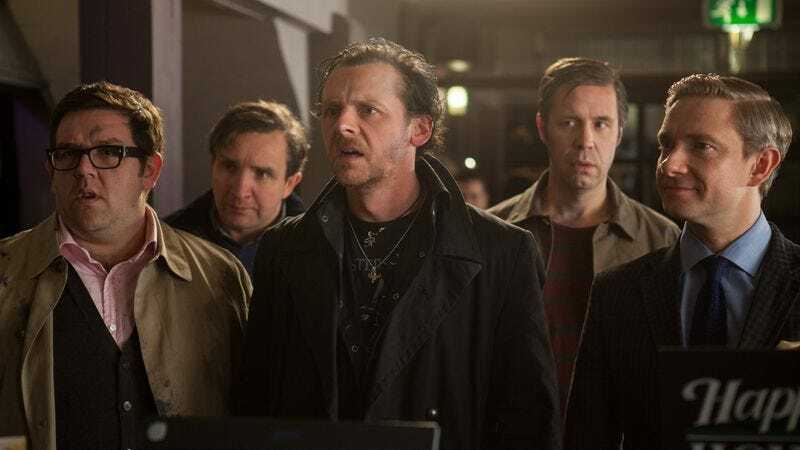 As formally assured as any film released last year, Edgar Wright’s The World’s End finds the Shaun Of The Dead and Hot Fuzz director again mashing up genres—guy’s-guy reunion drama, comedic odyssey, sci-fi invasion thriller—with a deftness that’s characterized by the finest editing of his career. Wright’s editorial choices have always been key to his films’ madcap, action-packed spirit, and with his latest, he cuts with even sharper precision. Reflecting the story’s repetitive nature and underlining its recurring motifs, his techniques accentuate the humor and poignancy. The result is a work of confidence and cunning bravado, its construction so highly attuned to the script’s whip-crack pace and emotional/dramatic tonal swings that only upon closer inspection can the artistry of Wright and editor Paul Machliss—who previously collaborated with the director on 2010’s Scott Pilgrim Vs. The World, as well as his 2001 TV series Spaced—be fully appreciated. The World’s End’s editorial strategies are established from the outset, with a blistering opening flashback montage of Gary King (Simon Pegg) during his high-school heyday with best friends Oliver, Steven, Peter, and Andy (played as adults by Martin Freeman, Paddy Considine, Eddie Marsden, and Nick Frost, respectively). The speed with which Wright and Machliss cut this sequence sets the pace of their forthcoming tale, which concerns the now-grown friends reuniting to finish a legendary 12-stop “Golden Mile” pub crawl in their sleepy childhood hometown of Newton Haven, and the extraterrestrial plot they soon uncover. The white-flash effects used for their edits re-creates the look of old home-movie film blips, and sets a suitably freewheeling tone. More to the point, their rapid-fire editing throughout this introductory passage is a setup for the sequence’s punchline, in which they finally cut to a long, unbroken shot of a grown-up, pathetic Gary in a support group. The jarring shift in energy elicits a laugh, but it also underscores the material’s overriding push-pull tension between the past and the present. That type of transition—from heavily edited moments of excited or violent action to images of quiet pathos or silent reaction-shot hilarity—is a regular component of The World’s End. Wright and Machliss’ use of this particular device allows them to seamlessly segue from rambunctious craziness to momentous spectacle to touching sadness—and back again—within a single scene. Take, for example, Gary and estranged best friend Andy’s final argument/fight upon reaching the last pub in their tour, The World’s End. In between rapidly cut footage of the two tussling, the filmmakers slow the pace—lingering on the characters’ heartfelt confessions of anger, resentment, self-loathing, and self-destructiveness—only to then resume fast-cutting when they start fighting again. Wright and Machliss can have it both ways: The silly and the serious are in equilibrium. The editing assumes a more traditional shot-countershot rhythm during many conversational scenes, but even then, the cuts highlight not only the characters’ goofiness but also their relationship dynamics, and especially their unified wariness of their leader, Gary. When Gary shows off his old car and then exhorts his mates, “Let’s get this antique ON THE ROADSHOW,” Wright and Machliss quickly cut to close-ups of each of the four friends’ mouth-agape faces—a comical design that’s duplicated when, in an unbroken take, Gary gives a lengthy, overblown oration about the crew’s forthcoming boozing mission, and the filmmakers cut to a hotel clerk staring at him, baffled. Moreover, when Rosamund Pike’s Sam first learns about the alien-robot invasion that’s taken over Newton Haven (thanks to Gary tearing identical cyborg twins apart with his bare hands), Wright and Machliss cut from the franticness of this sudden mayhem to a sustained shot of Sam’s bewildered countenance—yet another example of the duo using urgent shifts to close-ups to emphasize surprise, tension, and humor. Sometimes cuts aim only to create dizzying alcohol-insane liveliness. As in his prior films, Wright’s editorial signature involves split-second montages (usually of three or four images) that serve as either connective tissue between scenes or expressive punctuation marks. In The World’s End, these generally involve cars. For example, there’s an early triptych of Gary turning the key, popping in a cassette tape, and spinning his vehicle’s squealing tires. These moments are part of what gives Wright’s cinema a distinctly comic-book feel. All of these formal schemas are repeated throughout The World’s End, as is its most fundamental editorial technique: transitioning between scenes, as well as jump- and match-cutting between images, via what might best be referred to as “people wipes.” To segue to the next scene, and then again to leap to a tighter perspective on a given shot, Wright has a silhouetted form walk across the front of the frame, with the new image appearing behind the moving figure. Wright and Machliss use this incessantly, granting the film an overarching structural harmony. That favored device also becomes more complex as the story develops, so that when the crew arrives at The Old Familiar (pub stop number two! ), the place is introduced by a car crossing the screen to the left to reveal the establishment’s façade, then a person walking right to segue to a closer-up view of the building, and then a fast pan back to the left by some bushes (which “hide” the third edit via blurry motion) to find the friends strolling up to the bar. These “people wipes” create consistent left-right visual dynamism that’s vital to The World’s End’s aesthetic verve, and can also be found in the film’s two signature skirmishes (one in a bathroom, one in a pub), during which Wright and Machliss again use in-motion bodies flying across the screen to mask the sequences’ edits, giving the director’s already-long single takes an (artificial) sense of being longer than they are. Ultimately, however, The World’s End is equally notable for when it doesn’t cut at all—and that’s more often than it seems. Regardless of their material’s cacophony, Wright and Machliss find innumerable moments to allow the camera to simply linger on characters. In particular, the rants and ramblings of Pegg’s empathetically pitiful Gary are frequently allowed to play out edit-free, the better to let the actor—in a career-best performance—convey his characters’ complex stew of self-deception, arrogance, cluelessness, and deeply buried regret without any aesthetic brinksmanship getting in the way. Amid all the perfectly calibrated chaos, it’s one last example of how, with their sci-fi/comedy/action/drama hybrid, Wright and Machliss brilliantly attune their editorial form to their narrative content.